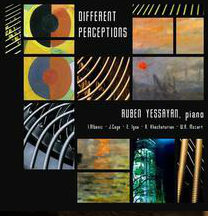 Ruben Yessayan, the Madrid based pianist and composer, has just released his second cd, a selection of Debussy's music including the first book of Preludes and Children's Corner. Mr Yessayan brings to this music his vast experience as a solo and ensemble performer who has specialised in music of the 20th century. As a graduate student at the Manhattan School of Music in New York he studied piano with Nina Svetlanova and chamber music with Isidore Cohen. It was during this time that he performed as principal pianist with the Claremont Ensemble. I remember hearing him perform with this group in a piano trio in an evening of Bartok music when I visited the Manhattan School of Music in 2004. His technical virtuosity combined with a rich and deep understanding of the music make his playing a joy to hear. At the same time he worked as apprentice conductor of the New York Youth Symphony Orchestra under the guidance of Mischa Santora. 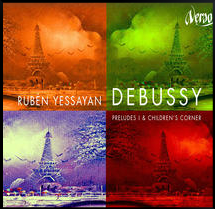 Later Mr Yessayan returned to Europe, where he has developed a career as soloist and teacher. He is also Artistic Director of the International Music Festival "Villa de Medinaceli", a post he has held since 2007. This new cd is available online via Amazon, Spotify and iTunes, as his his earlier cd, with music by Khachaturian, Mozart, Albeniz, Cage and Igoa.